Famed lyricist Chris Mosdell, known for his work with Michael Jackson, Ryuichi Sakamoto, YMO, Eric Clapton, Sarah Brightman and poet Shuntaro Tanikawa, will give a rare reading of his “very silly poems,” especially written for everyone from five to five-thousand years young! Written under his pen-name “MOZZ,” the poems, full of the rhythm and rhyme of the English language, are taken from his award-winning books (The Gold Prize Winner of the Moonbeam Children’s Book Award for Poetry, the USA Book News Award for Humour, and the EVVY Award for Humour) and will be accompanied by his wacky, fun illustrations. 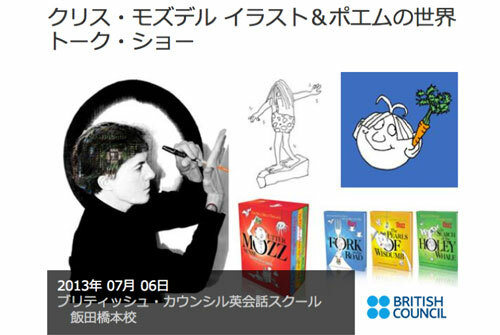 MOZZ will also talk about his love of poetry, his influences, and his writing techniques, following similar lectures at Denver Contemporary Museum of Art, Kyoto University of Art and Design and Kyoto International School. The audience will even be given the opportunity to write their own poems, and the winning poem, judged by MOZZ, will receive a signed copy of one of his illustrations.